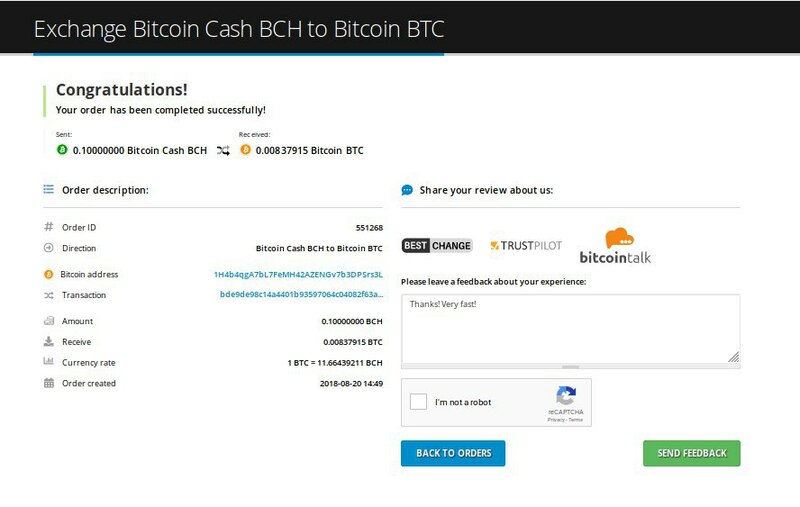 In this manual as an example we’ll show you how to sell your Bitcoin Cash (BCH) for Bitcoin (BTC). You can use one of the guide methods (Method 1 or Method 2) and then follow the selected guide method steps. b) Guaranteed rate means that exchange rate is ONLY valid for 15 minutes after order's creation time. If the payment wasn't received within 15 minutes interval, the rate will be recalculated. The exchange rate also will be recalculated for orders with unconfirmed transactions for more than 24 hours. c) The system fee (% depends on the exchange direction). d) Your personal discount. Discount is provided only to registered users (How-to register). You can learn more about discount here. e) Exchange type. Automatic means there is no human involved and exchange automatically will be processed as soon as we’ll get your confirmed payment. Automatic exchange directions are very fast from few seconds to 5-10 minutes. f) Required number of confirmations on the blockchain. 3. 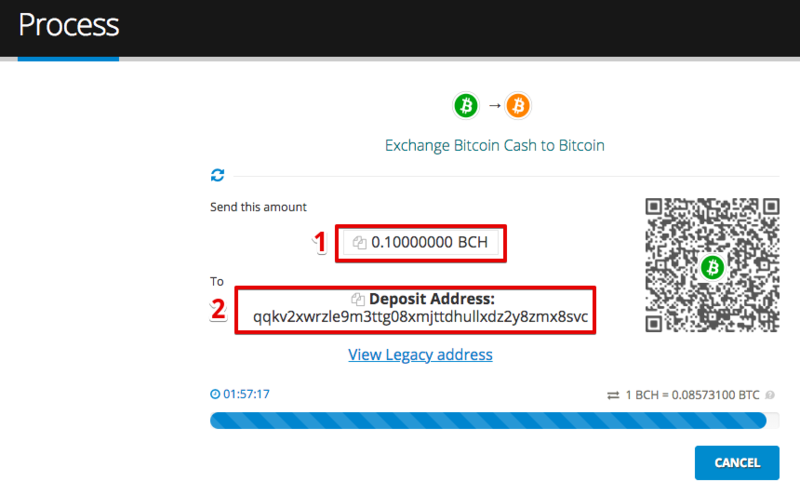 Now you need to enter the required amount of destination currency (2) (in our example: Bitcoin) or source amount (1) (in our example: Bitcoin Cash) you’d like to exchange. If you change destination amount the source amount will be automatically re-calculated and vice versa. 4. Enter your e-mail address (1) (if you’d like to get an e-mail when your exchange order finishes or leave it blank, e-mail field is completely optional). Enter your cryptocurrency address (2) where exchanged funds will arrive. Make sure to provide the correct address you own! In our example the cryptocurrency address - is the Bitcoin address. 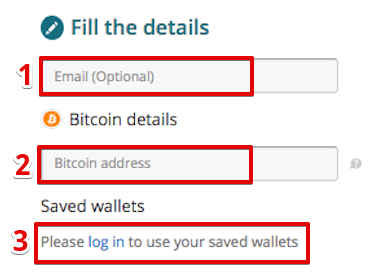 If you’re logged in you can save this wallet’s address for the future re-use or use previously saved wallet. Please Note: If your destination currency is XRP, Monero or NEM and you are transferring cryptocurrency to an online wallet, exchange or any other third-party service, you must specify appropriate Destination Tag for XRP, a Payment ID for Monero or Message for NEM, otherwise you can click on 'No Destination Tag', 'No Payment ID' or 'No Message' checkmark and leave it blank. 5. Accept the service terms (1), resolve the CAPTCHA (2) and then click on the Submit (3) button. 6. The next page is the payment page. You need to send exact amount displayed (1) to our deposit address (2). 7. After we've received unconfirmed transaction from you - the page will be refreshed automatically and system will indicate that we received your payment, but it's awaiting required number of confirmations on the blockchain. In our example: the order will be completed automatically after transaction gets 2 confirmations. 8. Congratulations! Your order has been completed! 1. At the main page, choose SELL menu in the upper menu and click the cryptocurrency you want to sell (in our case, Bitcoin Cash). 2. Select your preferred currency (1): USD, CNY, CAD, RUB, Crypto (in our case - Cryptocurrency), select the payout method (2): one of supported cryptocurrencies (in our case - Bitcoin). 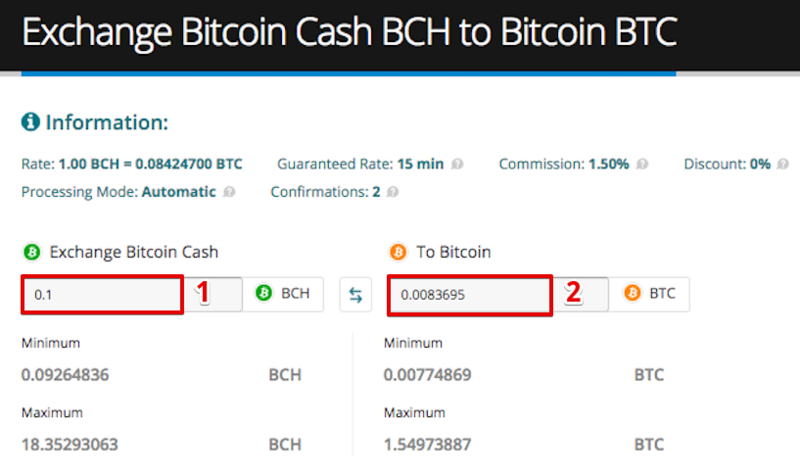 Enter either source amount (3) (in our example: Bitcoin Cash) or destination amount (4) (in our example: Bitcoin). In the left block you can see the same exchange conditions and information as in Method 1 (point 2) regarding guaranteed rate, processing mode, required amount of confirmations, system fee and discount. 3. Enter your e-mail address (1) (if you’d like to get an e-mail when your exchange order finishes or leave it blank, e-mail field is completely optional). 4. Accept the service terms (1), resolve the CAPTCHA (2) and then click on the Submit (3) button. 5. The next page is the payment page. You need to send exact amount displayed (1) to our deposit address (2). 6. 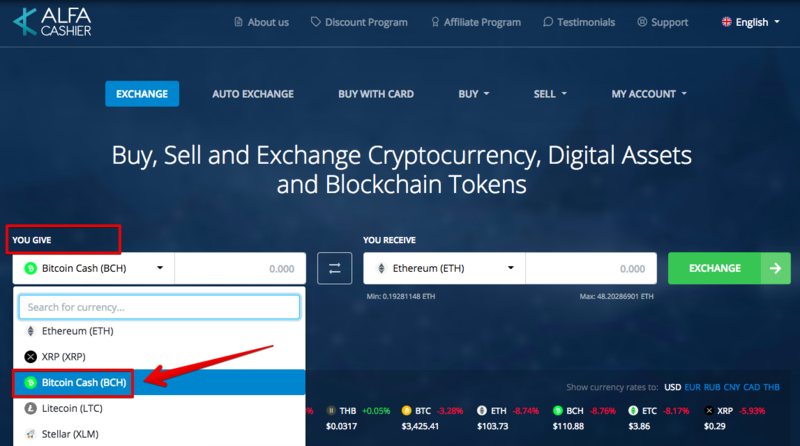 After we've received unconfirmed transaction from you - the page will be refreshed automatically and system will indicate that we received your payment, but it's awaiting required number of confirmations on the blockchain. 7. Congratulations! Your order has been completed! For your convenience, a message with detailed information of the order will be e-mailed to you. After successful payment, please leave some feedback about your exchange experience! Your opinion is very important to us! We hope you find our service easy and convenient to use.